This tutorial is suitable for use with a screen reader. It explains strategies for solving complex multiplications in your head such as 22x38. Work through sample questions and instructions explaining how to use partitioning techniques. Solve multiplications by breaking them up into parts that are easy to work with, use simple times tables, then solve the original calculation. This learning object is one in a series of five learning objects. Students investigate strategies for calculating products mentally. Students investigate partitioning numbers to calculate products using known facts. 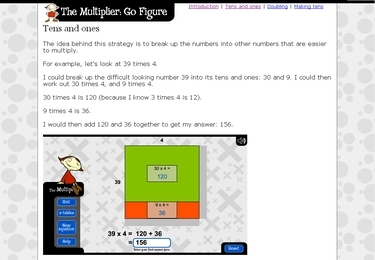 Provides explanations in support of the development of mental strategies to simplify and solve multiplication problems. Includes a tutorial that covers ‘tens and ones’, ‘doubling’ and ‘making tens’ strategies. Can be used with a screen reader.